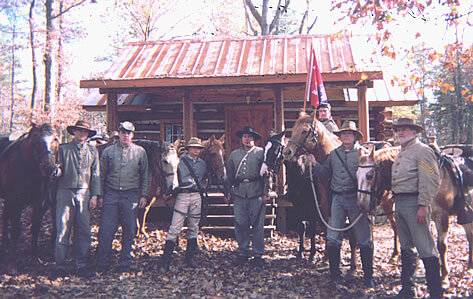 Affliated with the 26th NC Regiment and providing cavalry support is the TAR HEEL RANGERS . The Tar Heel Rangers is a family oriented, non-profit organization. We portray typical mounted troopers from North Carolina that were affiliated with the Army of Northern Virginia. At times we will serve as couriers to staff officers such as Maj. Gen. Jeff Stepp, commander of The Carolina Legion. Rank and File - The commander of the Tar Heel Rangers is Sergeant Bert McKenzie. All other member are privates. Once we recruit additional personnel, we will be able to support a greater rank structure. Uniforms - Troopers may wear shell jackets or sack coats. Double-breasted jackets are for officers only. Trousers can be of any period pattern but the uniforms should include some shade of gray. Yellow cavalry trim on the coat is optional. The trim can be either on the cuff or collar, but not on both. The preference is no yellow at all. Noyellow stripe is to be put on trousers. All garments must be wool and/or cotton and constructed to period patterns. Head gear can be of any period style, but remember that Confederates preferred wide brimmed slouch hats. Hat brass and plumes are optional, but plumes should be only black. Footwear can be of any period style, but cavalry boots are strongly recommended. Other items such as gauntlets and overcoats add greatly to your impression and may be added as you are financially able. We recommend that you contact a member of the regiment before purchasing any item so we may help you obtain the appropriate items. We reserve the right to inspect all items of your impression to assure authenticity. Weapons - We require each trooper to be armed with a period revolver of any make or caliber, although we suggest the Remington .36 or .44 as its cylinders are easily changed out, compared to the 1860 Colt Army or Navy .36 or .44. The recommended sword is the 1860 cavalry saber, but any period sword is acceptable. Long arms should be a short barreled, single shot musket or single shot carbine. Shotguns and unusual guns are discouraged and must be approved in advance by the commander. Horse Equipage and Mounts - The Tar Heel Rangers portray the mounted trooper. WE DO NOT ACTIVELY ENROLL DISMOUNTED CAVALRY. All members are required to have a horse and equipage. A member shall have two years to obtain his mount and full equipage. If the horse and equipage are not obtained, the trooper will move to the Dismounted Cavalry, but we will have a maximum of only five of that type. Appropriate horse breeds are a subject of debate. We accept any breed of horse, but for personality and temperament, the Quarter horse, first bred in the 1700's in North Carolina and Virginia, is preferred. Any color of horse is acceptable, though you may be warned that at some events, spotted horses such as Appaloosas and Paints have been discouraged as breeds that were not around in the 1860's. You may ride any period saddle and tack. The 1859 rawhide seat McClellan was most popular. Southern troops rode the Plantation, Hopes, Jennifers, Grimsleys, and other styles. We strongly recommend the use of a crupper and breast strap for saddle stability. A surcingle is mandatory. Headstalls and reins may be of any period military or civilian style. Leather may be black or russet. All 1859 McClellan saddles must be black when portraying Federal troopers. While we do not mandate that you acquire your gear from any one source, we highly recommend the products of Doug Kidd. He is one of the best and most authentic cavalry suppliers in the hobby today. He guarantees all his work. You should invest in well made cavalry equipage. Your life depends on it! As with the uniforms and accoutrements, we recommend that you discuss horse equipage purchases with a member of this regiment before acquiring them as all equipment must be approved. You will also be required to submit to a proficiency test of your riding abilities and the ability of your mount to remain calm and manageable under fire. This is absolutely mandatory to ride at an event with us. Your safety and the safety of everyone around you depends upon you and your horse remaining calm while you are firing from it and while other troopers are firing at and around you. You and your mount will be tested under the view of one of our veteran troopers. Union Impression - The Tar Heel Rangers do not make it mandatory for its members to portray Union. However, on occasion it is necessary to portray "the other side." If we attend an event as a group and we are supposed to be Union, all of the members are expected to be Union. Camping - You are required to obtain your own period tent. We recommend the 9-foot A-frame or the infantry "dog tent." Wall tents are restricted to officers and staff. All modern gear you wish to bring (such as ice chests) must be concealed from public view. The Tar Heel Rangers own some tents for loan. Equipment that is loaned is expected to be returned in the same condition in which it was loaned. When we serve on the general's staff, we will have a military camp with no children under 12 allowed. Dues - Dues for the Tar Heel Rangers are $25 per year and are to be paid by March 15 of each year. Dues for the 26th NC are $30 per year and are due in January of each year. Attendance - All members shall be required to attend at least two events per year. This will include drills, reenactments and living histories. How To Join - Reenacting can at times be physically demanding for both man and beast. Please give the matter careful consideration and come see us at several events to watch what we do. After reading this information and seeing these events, please contact one of the members listed for answers to your questions and additional information.